Cruise around Lake Michigan or see Chicago’s famous and historic architecture with Shoreline Sightseeing. No matter which cruise experience you choose, you’re in for an exciting time. Tours include professional narration, snacks and beverages available for purchase, and unparalleled views of Chicago. Each touring vessel has been custom crafted to ensure the safety and security of passengers. Tour lengths vary dependent upon the tour type and weather. Leashed dogs are allowed onboard. Snacks and beverages are available for purchase throughout the cruise. Boats are not easily wheelchair accessible. Bring your camera for epic pictures of Chicago’s cityscape and architecture. Explore Chicago's rich history, famous architecture and awesome skyline. 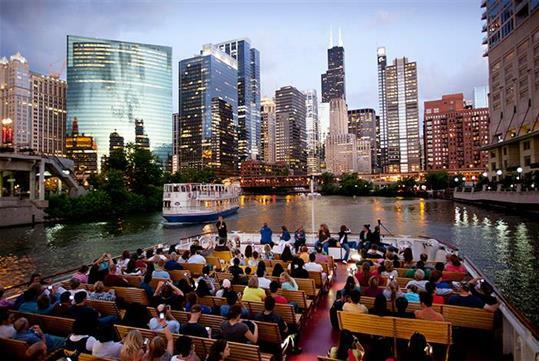 Choose From the Classic Lake Tour on Lake Michigan or Architecture Tours on the Chicago River. You’ll see the city as never before as you enjoy the commentary on Chicago’s dramatic history and architectural landmarks. 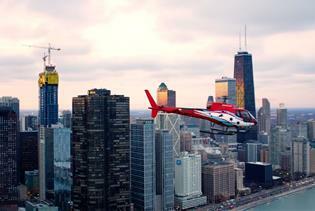 This 40-minute tour provides a panoramic view of the Chicago skyline. 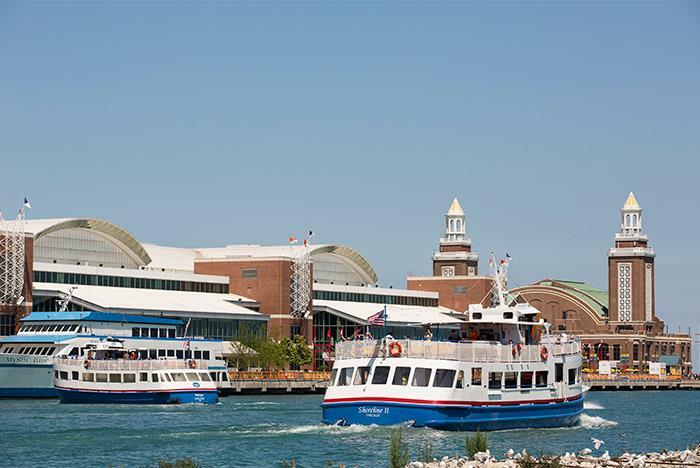 Classic Lake Tour from Navy Pier Departs from the south side of Navy Pier across from McDonalds 600 E. Grand Ave. 60611. Boarding begins 15 minutes prior to Cruise Time. Tour is 40-minutes long, please dress for an outdoor event. Boat will return to the same dock it departs from. **Cash bar on most boats. Shoreline's expert guides will share an insider’s glimpse into the buildings, architecture, and engineering that made Chicago famous as the birthplace of the skyscraper and home of modern American architecture. 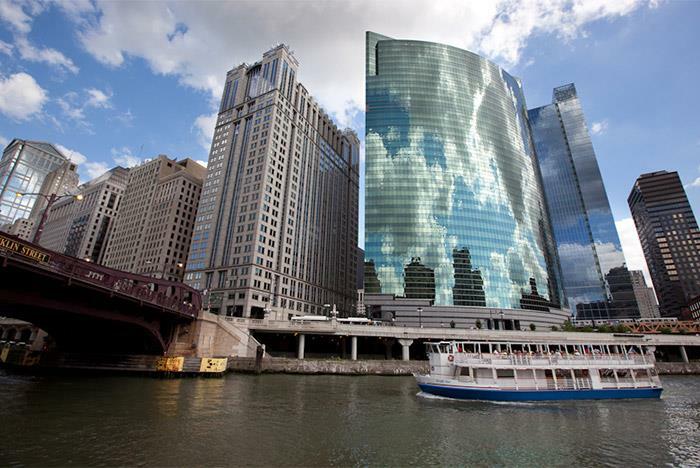 Nothing is more impressive than this world-renowned architecture as seen from the Chicago River on an architecture tour! Architecture Tour from Michigan Ave. Departs from Northeast Corner of Michigan Ave. (DuSable) bridge and the Chicago River. Tour is 75-minutes long, please dress for an outdoor event. The boat will return to the same dock it departs from. Not accessible to wheelchairs. Stairs required for dock and boarding. ** Our bars are not always open on the shoulder months. Have you been to Shoreline Sightseeing Boat Tours? Share your knowledge and be the first to review this. "Easy, Fun, and Simple Water Taxi"
We took the water taxi from Michigan Avenue to the Willis Tower. The tickets were only $6 each and the taxi itself is nice. On the taxi there are three types of seating, outdoor, outdoor with shade, and indoor. We sat in the outdoor with shade seating. I really liked this tour and would do it again sometime if I am ever in Chicago again. The only complaint is that it is a little slow. We had William as the tour guide. Great views on a sunny day. Purchased the tickets through groupon. Highly recommend! Really interesting and informative boat tour with these guys. 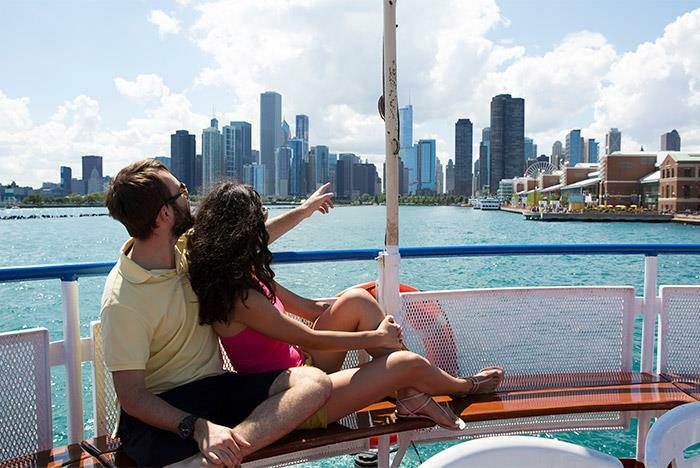 Based at Navy Pier, this tour gives you a chance to look at the city from the river and gives a unique perspective. The tour guide was really good and had great knowledge of the different types of buildings you can see. Well worth an hour of your time. We had the luck that it was a sunny day early april, we departed from Michigan ave. The guide (Nick?) was great and told very intresting things but also in a funny way. The views of all these great and tall buildings are impressive, even though it was cold outside we were glad we took this tour. Where does the Classic Lake Tour go? The Classic Lake Tour covers the entire downtown city skyline from north to south. The six-mile trip on Lake Michigan proceeds north past Navy Pier to the Hancock Building, east out to the lighthouse, and south towards the Willis (Sears) Tower and Museum Campus, which includes the Shedd Aquarium, Adler Planetarium, and Field Museum of Natural History. Do I need reservations for the Classic Lake Tour? Yes. Please note that while a ticket reserves your spot on the cruise, seating is on a first come, first served basis. For better seating, arrive early. What information is provided on the Classic Lake Tour? This cruise includes professional narration that highlights special events in our city’s history and points out landmarks on our famous skyline. What is covered on the Architecture River Tour? 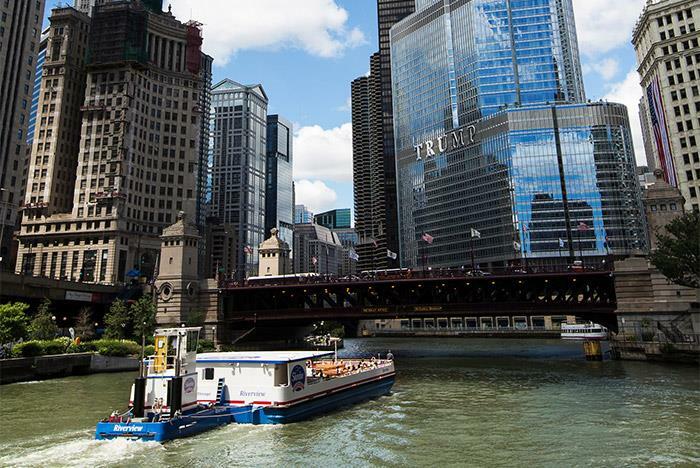 The Architecture River Tour goes down the main branch of the Chicago River, up the north branch to the East Bank Club, and then south past the Willis (Sears) Tower to the old Post Office Building. Each cruise is led by a professional and entertaining guide who provides detailed descriptions of more than 40 landmark buildings seen on the river cruise. Do I need reservations for the Architecture River Tour? Yes. As a popular tour choice in Chicago, these tickets sell out quickly. Please note that while a ticket reserves your spot on the cruise, seating is on a first come, first served basis. For better seating, arrive early. Will cruises operate rain or shine? 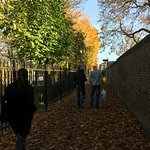 In the spring and fall, our schedule is largely dependent on weather. However, our tours will usually sail during the summer, though the weather may require a reduced schedule. It is up to the Captain to decide whether conditions are unsafe and to delay or cancel the cruise accordingly. If cruises are canceled due to stormy weather, or any other reason, refunds will be issued for pre-purchased tickets. Most of our tour boats are double-deckers with a partially covered overhead, but four of our Architecture River Tour boats have a single deck with no cover. Do your boats go through the locks? Alcohol is available on most of our boat tours. Are snacks and beverage available for purchase? Do the boats have restrooms onboard? Are your boats accessible to people with disabilities? 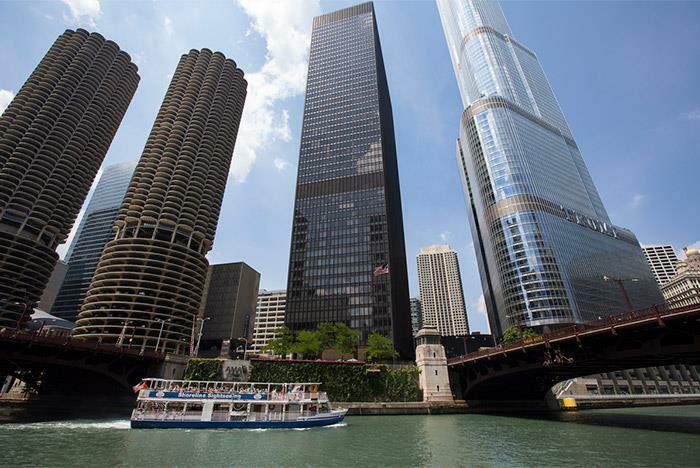 The upper decks of our Chicago River Architecture Tour boats are accessible to people with disabilities. However, our vessels are not equipped with elevators. Therefore, restrooms, which are located on the lower deck, are not accessible. 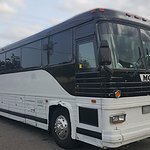 Additionally, the upper decks of our Architecture Tour vessels are open and provide no protection from the elements, although we do have a light-weight awning-type covering in the event of rain. Our Classic Lake Tour boats have limited access to people with disabilities. Our ramps are accessible only to wheelchairs with a narrow base and not at all to motorized vehicles. Do you allow dogs on board? Yes, leashed dogs are allowed.